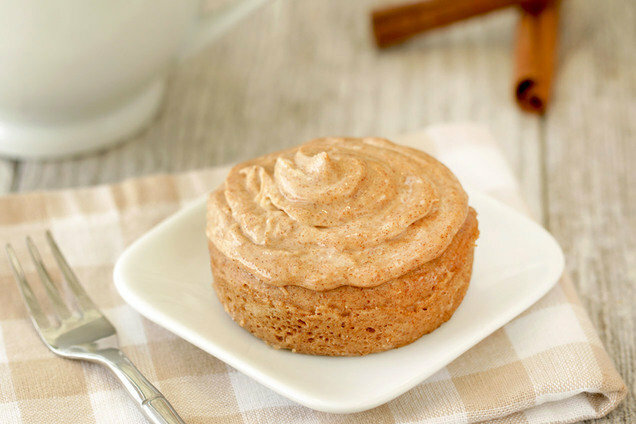 The gooey icing and fragrant spice of a freshly baked cinnamon roll pair so well with the sweet fluffiness of cake. Make it in a mug, and you've got a portion-controlled treat that's perfect for crushing your cravings! Spray a microwave-safe mug with nonstick spray. Add flour, sweetener, cinnamon, baking powder, and salt. Mix well. Add remaining cake ingredients. Whisk with a fork until uniform. Microwave for 1 1/2 minutes, or until set. Meanwhile, in a small bowl, mix icing ingredients until mostly smooth and uniform. Once cooked, immediately run a knife along the edges to help separate the cake. Firmly place a plate over the mug, and flip so that the plate is on the bottom. Gently shake mug to release cake onto the plate. HG Tip: For perfectly swirled icing, use a DIY piping bag. Transfer icing to a plastic bag, and squeeze it down toward a bottom corner. Snip off that corner with scissors, creating a small hole for piping. Hungry for More Cake in a Mug Recipes? Happy National Vanilla Milkshake Day, June 20th! The only thing better than a vanilla milkshake? A caffeinated one that's loaded with protein! What? Your friends don't like cake and cinnamon rolls? That's what we thought; click "Send to a Friend" or forward this recipe now!